Using a collaborative approach, complete the following information in preparation for a presentation to your colleagues on a student in your area of learning or teaching experience. • What is the area of instructional concern? • What are the student’s current abilities? • What are the student’s areas of need? • What are the significant characteristics of the student learning environment? • What is the physical arrangement of the learning environment? • What is the instructional arrangement in the learning environment, e.g. classroom, small group, or learning stations? • What materials and equipment are students and teachers using? • What are the instructional expectations for all students in the learning environment? • What specific learning tasks are essential in the student’s achievement in this instructional environment(s)? • Where are the gaps between student performance and instructional expectations? 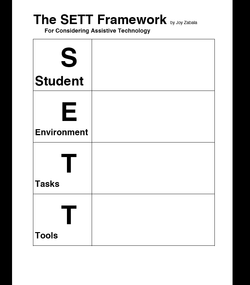 • What tools (low and high tech) are being used currently to support the student(s)? • What additional tools does this student require to perform in this environment? • What strategies might be used to motivate the student’s performance? • How will these tools provide an equitable learning environment for the student(s)in meeting learning outcomes? Outline your plan for implementing assistive technology tools for this student. The plan must include consideration of the identified learning environments and the instructional tasks? • Identify all human resources and indicate their roles in supporting the student. • Develop a timeline for implementation including time required to assess effectiveness of this intervention. • How do you intend to use these tools and strategies to support student performance? • What training do the student and staff need for successful use of these tools? • How will the effectiveness of this intervention be measured?